Krispy Kreme Grass Flip Flops… I Have No Idea What's Going On Here | OhGizmo! I’m still trying to figure out if this PR stunt by Krispy Kreme is nothing more than a sight-gag, or an actual giveaway. According to the company’s ‘research’, they found that 3/4 of UK workers felt stressed on a daily basis, but taking a walk in the park was enough to make them feel instantly relaxed. 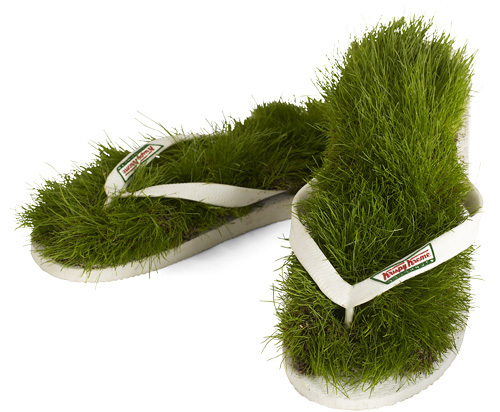 So as a compromise, Krispy Kreme starting giving out these unique sandals to London commuters, which bring a grassy park to their offices. Krispy Kreme questioned over 1,000 UK workers and found that over half (53 per cent) of urbanites believe their stress levels are affected by a lack of contact with Mother Nature. In response to the problem Krispy Kreme has created the world’s first grass flip-flops to bring summer magic to the city – giving stressed out workers a (literal) spring in their step by creating an instant grassy park underneath their feet regardless of their urban location. The al fresco flip-flops take up to three weeks to grow and each shoe is covered with over 5,000 blades of grass. If watered regularly the unique footwear can remain in season for over four months – meaning they are the perfect, head-turning summer-accessory for stressed-out men and women. So, have any OhGizmo! readers in London actually seen or received a pair of these sandals? I don’t really care if they turn out to be nothing more than a gag, since in my eyes Krispy Kreme can do no wrong, but I am curious. Hi Dan, I was hoping someone from your agency would see my post and comment. I’m glad to hear the promotion was real, and I’d love to see the reaction photos. So that neither of us have to divulge our email addresses please use our contact form to get in touch with me (using the ‘Contact Us’ link above) and I’ll get in touch with you further. Why do companies always do the best marketing in Europe? I would love a pair for when I am work! As Jen says, I really would like a pair at work. They would be a relief in all the hours sitting here. Too bad here in Mexico is almost impossible that somebody do something similar. Those sound very cool! Do you think you will be giving them away in the U.S anytime soon? I would love a pair!